The BNP Paribas Open draw was held on Monday and main draw action will get underway on Wednesday for the first Premier Mandatory tournament of 2017. The influx of pictures the weekend before Indian Wells never fails to make me jealous and begin considering a trip to Palm Springs! The full draw for Indian Wells can be found HERE. Note – This preview has been edited to take account of the draw reshuffle on Tuesday night. Pliskova takes Serena’s position at the top of the draw: In a late draw reshuffle following Serena Williams’s withdrawal from Indian Wells, Karolina Pliskova was bumped up to her position of the draw. While Jelena Ostapenko was previously a potential second round opponent, she’ll now be in line to possibly play Monica Puig in the second round…. first thoughts were not easy but Pliskova hasn’t dropped a set against Puig in three previous encounters. All-Swiss R3 Battle? – I’m all over the possibility of a third round encounter and first ever meeting between Timea Bacsinszky and Belinda Bencic. Bencic has got hosed with several draws this year but this looks workable. Tsvetana Pironkova is first up, a player she has never lost to in three previous encounters (two of those were on grass). The winner gets the number 18 seed, Kiki Bertens, who has lost her last five matches on tour. 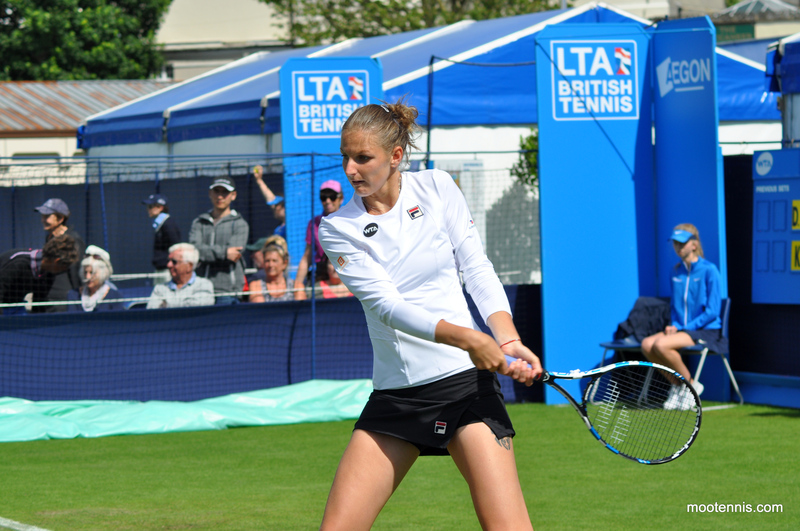 Bacsinszky could have her hands full with nemesis, Monica Niculescu in the second round although she has produced come-from-behind wins in their last two encounters, both at Wimbledon. Halep’s back – Early signs appear to be promising for Simona Halep who has been bothered by a knee injury in 2017 but is set to return at Indian Wells. A potential third rounder against either Kristina Mladenovic or Eugenie Bouchard would be a match worthy of circling in thick red ink. Dangers in the draw for Radwanska – 2017 hasn’t started so well for Radwanska and there are some early dangers in her draw with the likes of Ekaterina Makarova, Acapulco champion, Lesia Tsurenko and her conqueror at last year’s US Open, Ana Konjuh. Based on recent form, she’ll do well to reach the last 16. Venus-JJ R2? – A nostalgic trip down memory lane could be on the cards if Jelena Jankovic gets past Irina Falconi in the first round and sets up a second rounder against Venus Williams. Jankovic leads their head-to-head, 7-6, but they’ve played just once in the last five years. The last couple of tournaments in Doha and Dubai have all been stinkers for Angelique Kerber in terms of records and that’s kind of the case with Indian Wells for the number two seed – while she did make back-to-back semi-finals in 2012 and 2013, Kerber has lost her last four matches in the desert. Karolina Pliskova, Simona Halep and Agnieszka Radwanska have all had excellent results at Indian Wells in the last few years – for Halep, her title in 2015 is the biggest of her career so far and in 2016, this tournament marked the start of her rejuvenation after a stuttering start marred by injuries. Garbiñe Muguruza is the only top eight seed not to have reached at least the quarter-finals in Indian Wells. While the number eight seed, Svetlana Kuznetsova reached back-to-back finals in 2007 and 2008, she has posted a 5-8 W-L record from 2008 and hasn’t made it past the third round since then. From seeds 9 to 16, Madison Keys and Elena Vesnina are the only players to have not advanced past the fourth round. In fact, Vesnina fell at the first round of qualifying last year to Julia Boserup and has only won back-to-back matches once at Indian Wells. In stark contrast, this tournament has been a happy hunting ground for Caroline Wozniacki who is a former champion and reached at least the fourth round every year between 2008 and 2014. While she has won just one match in her last two appearances, Wozniacki arrives this year with renewed confidence and seemingly in full fitness. 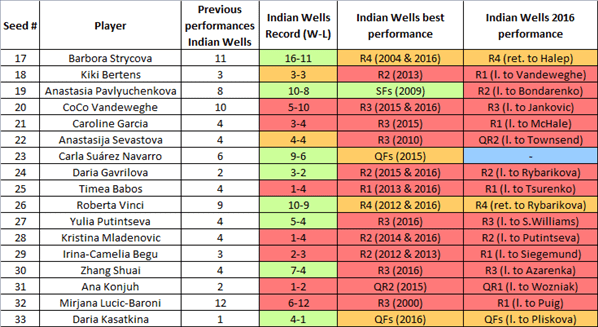 Barbora Strycova’s first and most recent performances at Indian Wells were her highlights, reaching the last 16 in 2004 and 2016. The Czech player has posted consistently solid results at the big tournaments in the last year or so. Anastasia Pavlyuchenkova also produced her best performance in a first showing in 2009 when she reached the semi-finals – since then, she hasn’t advanced past the third round of Indian Wells in seven tries. CoCo Vandeweghe, Roberta Vinci and Mirjana Lucic-Baroni have all played the tournament many times and mostly without great success with none of the trio ever reaching the quarter-finals. It is apparent many of the seeds are relatively inexperienced at Indian Wells – Ana Konjuh is seeded but will be playing the main draw for the first time in her career, while Timea Babos has never made it past the first round. March 7, 2017 in Indian Wells, Tournament Preview, WTA. It’s Serena’s if she really wants it. But being #1 doesn’t seem to be her top priority so who knows! I would’ve given Kuznetsova a good chance here but she’s coming in pretty cold after a few months off. I’d fancy Konta, Svitolina and Pliskova to continue their good years with good runs here. I like Svitolina to reach the QFs with this draw, Pliskova also and beyond. I’m not so keen on Konta this fortnight though as she comes in cold like Kuznetsova – i’d expect both to be threats in Miami. I think the court type most favours Kuznetsova. If she can really deliver deep, heavy topspin groundstrokes then these courts can be her friend. I wouldn’t count out Muguruza, Cibulkova or Konjuh doing well here either, if they can build some confidence. I’m really intrigued by both draws this week. Equally baffled by Djokovic’s start to the year, been an interesting start to 2017 for the ATP. Serena Williams had an amazing start to her 2017 season. Most people thought that she would be under a lot of pressure to surpass Steffi Graf’s record of 22 Grand Slam titles at the Australian Open. But, I saw this more from a positive perspective. Serena came into the Aussie Open with a lot of confidence, knowing that she had that 22nd Grand Slam title win under her belt and she didn’t have to worry about equaling Steffi Graf’s record anymore. I feel like she went into the tournament with less pressure. Now that she won Grand Slam title #23 Down Under without dropping a set (6-4 6-3, 6-3 6-4, 6-1 6-3, 7-5 6-4, 6-2 6-3, 6-2 6-1, 6-4 6-4), she’s definitely back on track. After the Australian Open, Kerber, Pliskova, Muguruza, Halep, and Svitolina all were playing different tournaments in the Middle East. But, Serena took a nice long six-week break to give her body some rest. I feel like she will be the most well-rested player on the WTA tour so far. Based on her results so far, I predict that Serena will reach the final without dropping a set and win the title in three sets. Or, she will win the title without dropping a set. Halep hasn’t played in as long as Serena has really, she missed Doha and Dubai with injuries. Eeek just been announced that Serena has withdrawn from IW. Means Kerber will go #1 regardless of her results. May just give her the boost she needs to kickstart her season. You think so, Andrew? I felt like it was a burden for her. I’m slightly gutted but I guess Serena really is injured as she has also withdrawn from Miami which is one of her favourite tournaments. I think she will fully concentrate on the grand slams. I don’t feel like being #1 was a burden for Angie, actually, but I do think that like most players on tour, she really struggles defending ranking points from successful tournaments the year prior. With Serena out of Indian Wells AND Miami, Kerber has a bit of breathing room to do well at two events that she didn’t do too well at in 2016. And aside from Stuttgart, she doesn’t have a great deal to defend over the clay season either. I have been busy so I missed most of the Dubai and Qatar events but I should be able to watch most of this and I am looking forward to it. I’d also like to see Timea Bacsinszky and Belinda Bencic play each other. This should be a chance for Belinda to win her opening match ( even though her opponent is not one to underestimate ) so it will give her some much needed confidence if she does win. Serena Williams should win this event but I do sometimes wonder how motivated she is to win WTA events which are not Grand Slams. I was going to select the improving Karolina Pliskova to win as she has been in good form this season but she is also in the top part of the draw along with Serena and some other useful players so I have looked to the lower part of the draw for my selection. My tentative vote goes to Dominika Cibulkova who has some easy looking matches in the opening rounds and should get to the quarter finals at least. She has played quite well so far this season and only just lost to Agnieszka Radwanska here last year so she is my selection. I think Cibulkova could be a good pick. I wouldn’t underestimate Pliskova if she met Serena here, though. Ahh nice to see you back, Peter. I read an interesting article with Domi a few days ago where she talked very candidly about dealing with pressure this year and said she felt more like herself since Doha. I’d actually say her draw is pretty tricky, Zhang/Osaka in R3 wouldn’t be straightforward IMO. Serena seems healthy and will go for the win. I think the draw is top heavy again. Kerber has another easy path. I’m looking forward to the Bellis vs Flipkens first round match. The K Day vs K Nara could be interesting, as the 18yo K Day has had some good ITF results. Bouchard vs Beck- Does Bouchard have anything left?——-Temps for Friday 92f/33c 22% humidity and no rain!!! There is a mountain range between Los Angles and the Palm Springs,Indian Wells area. LA gets the rain from the Pacific storms and PS/IW area usually gets no rain. I really like Kayla Day’s chances of getting a win there. A talented player and one to watch for the future. Even though Serena withdrew from both Indian Wells and Miami, I believe that’s a good sign for her. She’s really prioritizing the Grand Slams more at this point in her career. This will give her more time to get ready for the French Open. Now, I’m wondering who will really make a good run in Indian Wells. It’s extremely tough to say – the title could be anyone’s. Agreed. I think saving herself for the French and Wimbledon double whammy is obviously her priority. Does Serena still pocket the advance money, even if she doesn’t show up? I think you have to play at least one match, but may be wrong. It won’t have been her decision to leave it so late to announce this. Being the marquee player, the event and the wta will have made it so. I’m interested to see who will be a big favorite to win the title now, after Serena’s withdrawal. Serena had clearly highlighted that she is prioritizing the Grand Slams over the #1 ranking in this scenario. Even though Kerber will return to #1 at the end of the tournament, I don’t think her streak will last that long. Last time Kerber was #1, she did NOT win a single WTA title on tour. This may be hard to imagine, but I’ve seen it before. I feel like the title could be anyone’s, which is why I haven’t picked a favorite. But if I have to pick a player, I’m going for Pliskova. what is Bellis the female version of Fritz? No thanks. Bellis needs to show more patience when matched against players like Flipkens. The old war horse tricked the young filly into making UFE after UFE after UFE. Flipkens also threw her hole bag of shots at Bellis, with good effect.